With previews and teasers, it’s sometimes easy to miss when useful new tools actually become available to you. Two tools this week became available, each potentially high on the utility end of the spectrum. There’s no shortage of variety in iOS music creation apps, but when people really want to get down to music making, many of them want to focus on one tool, not twenty. (That’s not universal – ask Richard Devine‘s screaming VST plug-in folder – but you ought to at least be able to make such a choice.) It’s therefore little surprise that there’s been a lot of buzz around NanoStudio. NanoStudio incorporates a range of tools in one app. There’s a virtual analog synth, a 4×4 pad for sampling and sample playback, a sequencer for notes and control, a mixer and rack of mastering effects. The emphasis is clearly on completing entire productions. In more lightweight form, it reflects some of the appeal of tools like Reason and FL Studio (particularly recalling, say, the simpler early releases of Fruity Loops). That’s not a totally new idea on iOS – Intua’s Beatmaker was an early entry for those wanting an integrated studio – but it’s an especially nice take here. In control and sampling, NanoStudio looks really flexible. The virtual analog synth has extensive envelope and LFO controls, and input from X/Y controllers, pitch bend, and your iPhone accelerometer. You can even insert up for four independent synths. The sampler will work with the built in mic, it’ll bring in samples from your PC or Mac, and – best of all – you can resample from NanoStudio. All in all, it looks like NanoStudio could be the more comprehensive production studio on iOS yet, without sacrificing simplicity and large, readable interfaces. You can buy it now on the App store for GBP8.99, and there’s a free trial of a development version for Windows and Mac (minus the touch features) so you can see if you like it first. 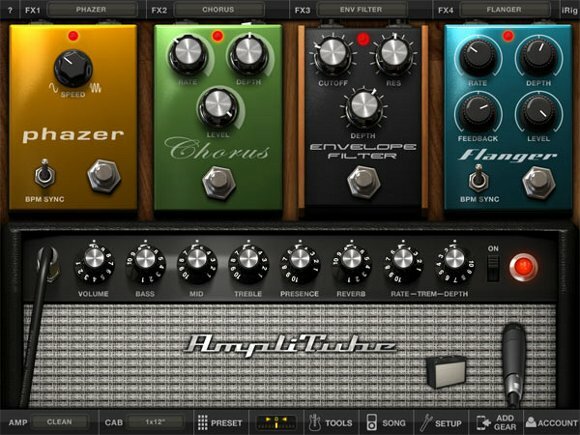 In other news, IK Multimedia’s AmpliTube package of virtual guitar amp/effects/tools is now available for iPad. In a basic version, it’s actually free, with three stompboxes, one amp/cabinet, and two mics. The idea is to get you hooked, and either collect additional tools via a la carte downloads, or get the full collection for US$19.99. Without external hardware, AmpliTube isn’t much use, but you can buy interfaces from IK and other vendors. (You can also use an existing class-compliant USB audio interface with the iPad.) Consensus from readers is that these mobile guitar tools would be best as on-the-go practice tools. As opposed to the iPhone, the iPad gets a big, gorgeous, readable interface. It’s still not a stage tool – not until Apple finds a way to perfect iPad input with your feet. (Hey, that may not stop someone from stripping their socks off, putting their iPod on the floor, and using this with their toes.) But as a practice tool, it’s another option. It’s still not shipping, but one of IK’s rivals has fleshed out their website since I covered them last; see AmpKit. And you will, incidentally, be able to mix and match apps and interfaces, meaning even IK fans may want to keep an eye out.